This post continues from the previous one. 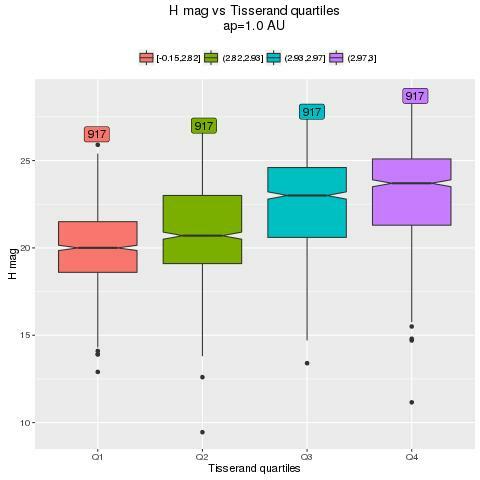 Let's take again the plot H mag vs Tisserand's parameter with respect to Earth (ap=1 AU). 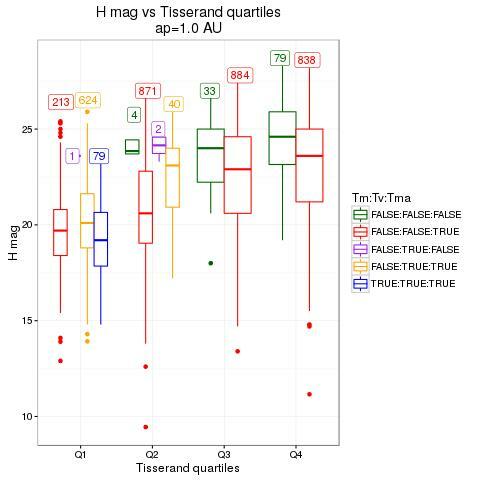 We have also seen that most of these Amors have also Tisserand's parameter with respect to Jupiter, Venus and Mars < 3 (actually, I refer to it as "Mars" but the exact value for which there was a relative greater correlation between H mag and Tisserand's parameter was ap = 1.65 AU). A possible question is:how are these asteroids distributed in the various TEarth quartiles? I do not know enough about statistic to say that the above is really significant, but I can give you my feeling. in TEarth quartile Q1: those 79 Amors having Tm<3 (and also Tv and Tma <3) tend to be the brightest.